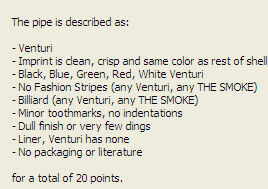 The value of pipe #294 is 20 points. Steve Veenstra offered this pretty good black Venturi Bent on eBay. I won the auction and so have improved the collection a bit. My former example of this shape/color will go to the Pipes for Sale page. When I got an un-smoked example it became this one's turn to be sold. Michael Lavery bought it.